The Purif Pack is a special pack used for Detoxification Programs. 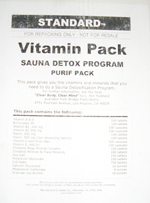 This pack gives you the vitamins and minerals that you need to do a Sauna Detoxification Program. Also you would need the All Blend Oil.